Compliance with current phosphorus (P) fertilization recommendations would ultimately result in a soil P status of agricultural land in the agronomical optimal range. In practice though there are large variations in soil P status among farms and fields. Our study aimed at increasing the understanding of the cause-effect relationships for these spatial variations in soil P test values. The Northeast Polder in The Netherlands was chosen as study area, because of its characteristics. It was reclaimed from the sea in 1942, has one major soil type (calcareous loam), well-educated farmers, one dominant land use (arable farming) and little pressure to use animal manure. We tested the hypothesis that in this polder mean P status has developed towards the optimal range with a small standard deviation. We analysed available soil P analyses records (>30,000) from the period ~1950–2004, and conducted a questionnaire about fertilization practices among farmers. The soil P(w) values increased steadily and significantly from the agronomical range ‘low’ to ‘ample sufficient’ from 1971 to 2004. Variation within and between farms also increased. 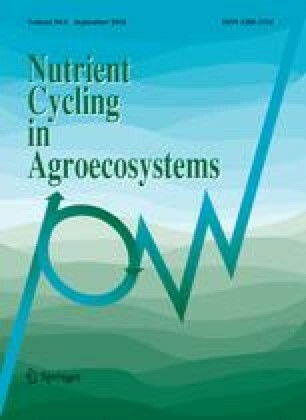 About 45 % of the farmers appear to aim at a soil P status above the agronomical optimal range, and >70 % of the farmers indicated that they are uncertain whether the obtained increase in soil P(w) status is actually plant available P. In conclusion, our hypothesis was rejected: for farmers in our study area, risk avoidance seems the decisive factor for pursuing a soil P status above the agronomical optimal range. If even well-educated farmers question the official fertilizer recommendations and aim at higher levels of soil P fertility, also other farmers worldwide may continue to aim such supra-optimal soil P status. This is undesirable given the diminishing P resources. Possible solutions could be to define more refined P fertilization recommendations and better and more intensified communication of those recommendations to farmers and their advisers. We are grateful to Frans Aarts (Plant Research International, the Netherlands) for providing historical soil data. We thank the farmers in the Northeast Polder for participating in the written survey, and we thank Dr. Aad J. Termorshuizen for his comments on earlier versions of this paper.